It's a unique, engaging way of learning about DNA extraction. Developed in partnership with Brookhaven National Laboratory, this DNA extraction lab involves a fun twist that both simplifies the process and helps guarantee understanding. Students swish a sports drink (not included) in their mouth to break open or lyse their own cheek cells. This fluid is then added to a detergent containing sodium dodecyl sulfate (SDS) and heated to break down the fats and proteins of the cell membrane. Ethanol is gently added to the solution to reveal the DNA precipitate. Once isolated, students can display their own DNA using the colorful cord and microcentrifuge tubes included or glass vial necklaces, available separately. 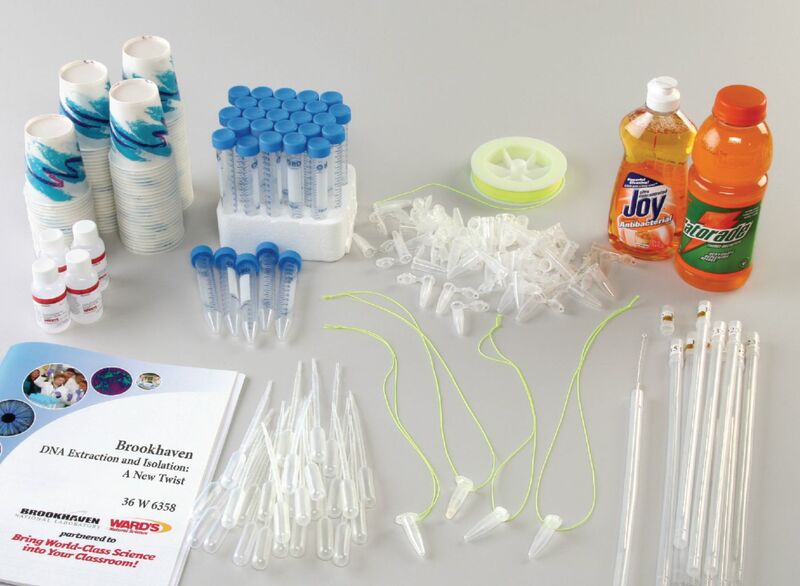 Ordering information: This kit includes plastic inoculating loops, a lab marker, nylon string, paper cups, detergent, 15 mL centrifuge tubes, microcentrifuge tubes, transfer pipets, and ethanol. Sports drinks, a hot-water bath or hot plate, graduated cylinders, ice, and a test tube rack are needed but not included.